School motto: "Where kids love to go!" Our motto above says it all. At the Chabad Sunday school the children really enjoy the experience. Just ask them and they will tell you. various backgrounds and affiliation. This is why Chabad's pre-school, Sunday, and Hebrew school classes are where kids love to go! Our curriculum includes Hebrew language, Jewish holidays, Jewish history, traditions, Jewish ethics, and much, much more. Not sure? Feel free to try it out for a few sessions. Need based scholarships are available! Call Rabbi Zalman Fischer or Chani Fischer for further discussion. 706.722.7659. Synagogue membership is not required, in fact we don't have membership! 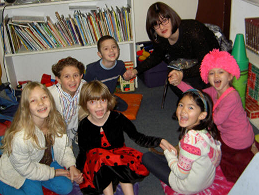 The mission of the Chabad Hebrew School is to provide and promote the highest quality Sunday School Judaic education to a diverse community of Jewish children. Our aim is to nurture and build the foundation of your child(ren)'s Jewish identity through our interdisciplinary educational approach. The focus of our dedicated teachers is to inspire a two fold love. A love for learning and a love for Judaism while fostering a feeling of familiarity within their heritage for each individual child. A well-balanced Hebrew School education will develop in our students a commitment to using Torah values as a guide to the decisions of life, community, and life-long learning and teaching. Hands-on experience appreciation for all Jewish holidays. Learn prayers so that the students will feel comfortable when attending services. Identify with the land of Israel & its inhabitants. Allow students to express their opinions and questions about G-d, Torah & religion. Hebrew - Beginning with letter recognition for our youngest children, this program leads students through phonetic decoding, reading comprehension & writing. Age appropriate textbooks & workbooks will be completed throughout the year. We also implement the successful and effective Aleph Champion Program. Torah (Bible) & Jewish History - The children are introduced to the characters & stories of the Torah. They are given an overview of Jewish history starting with creation to the giving of the Torah to modern day Israel. Holidays - Each grade examines the holiday from a totally different perspective, making each year's learning a new & exciting holiday adventure. Hands-on lessons on each Jewish holiday will fill the calendar as we proceed from Rosh Hashanah and the High Holidays through the holiday of Shavuot. The students will have a deeper understanding of each holiday, its traditions & customs. We will also host holiday celebrations for students & their families. Jewish Values & Ethics - Each year we cover a different aspect of our Jewish values & ethics. "Marvelous Midos & Manners," which is a selection of 12 human-to-human Mitzvot, including respect, gratitude, & tzedakah. Discovering the treasure within" A soulful journey into the meaning of life, the joys of being Jewish, the soul connection on our food, song, prayers and holidays. My Jewish Home" gets a virtual tour of the mitzvot connected to a home, including Mezzuzah, Shabbat, Kosher & Cleanliness. A better world begins with me" How to live a better life and make the world around us a better place. Torah and Mitzvot encyclopedia, including the environment, appreciation, humility, proper treatment of animals, kiddush & happiness. Arts & Crafts - Art projects are incorporated into our curriculum to add to the excitement of the upcoming holidays and Mitzvot. Extra Curricular - We offer a variety of extra curricular activities such as special guest speakers, Friday night dinners, and contests. These events allow our students to experience Judaism in its entirety. A point system based on in-class & out-of-class participation will allow students to reach different award levels. Family Workshops are part of our Hebrew School curriculum. Through a series of stimulating, hands-on workshops, we effectively provide a unique & creative educational tool that links Jewish learning to Jewish practice & living. The entire family is encouraged to join us & participate in these educational workshops.